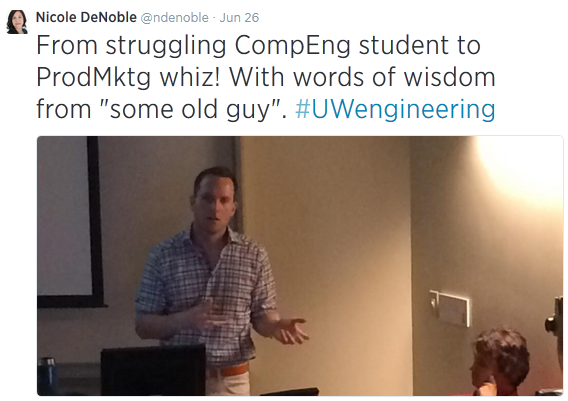 Last week, as part of the Alumni Speaker Series (haha, I know…right? 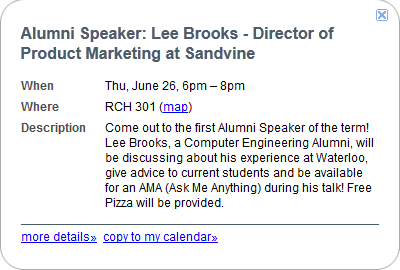 ), I returned to the University of Waterloo to speak to a group of (mostly) engineering students about my experience at UW and my career since then. It was a well-attended session, drawing a bigger crowd than had registered, and really went tremendously well – better even than I had hoped (and I tend to be quite optimistic). I also reached out to other friends who didn’t go to grad school, again just to broaden the perspectives that I could share. 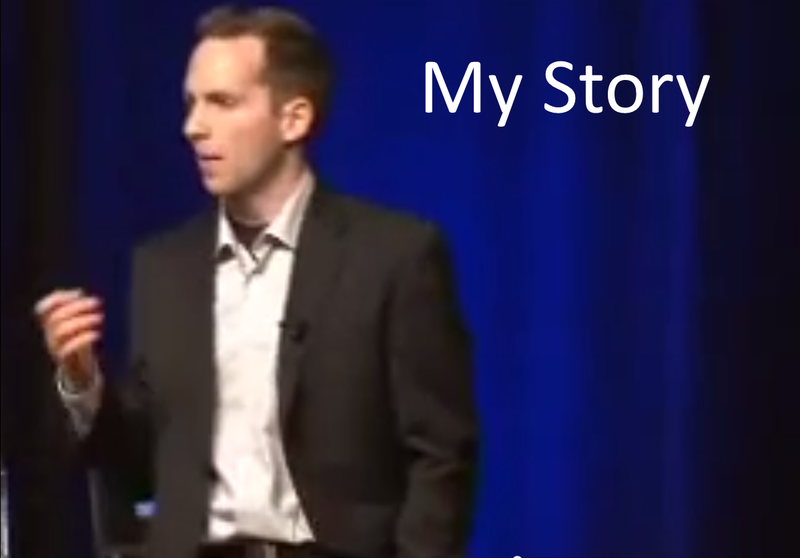 My story is just that, my story, and everyone’s was unique. I was hoping that by asking for many perspectives I could spot trends, and this turned out to be the case. I had pitched it as an AMA (ask me anything), and that language made its way into the official calendar ad. Ad on the engineering calendar. The day before the session I saw this tweet, and realized that I had to insert some content about Product Marketing! Blargh, this caused some people at work to find out! Damn you, Google Alerts! Coincidentally, the session was held in RCH 301, which Nino assures me we used for many classes but which I only vaguely remember. I recognized the big skylight/hole in the floor, though, so he might be telling the truth. Anyhow, for about 45 minutes I went through my story, starting with an explanation of my complicated relationship with UW, and then going through lessons I’ve learned over the years; then I handed it off to Nino and he offered his own perspective, and thankfully didn’t contradict too much of what I’d said. Then, for a full hour (!!!) we fielded questions from the wonderfully attentive crowd…on life, undergrad, grad school, career stuff, etc. OK, not the most creative title. I must say, we benefited from a fantastic crowd. Nino and I were there with the UW reps about twenty minutes early, and some students were already coming in. This gave us the chance to just mingle and chat and really break the ice; then, when the presentation was in full swing, the crowd had no problem asking questions. While my presentation was about my story, the input my friends provided gave me lots of additional content to speak to, whether their experiences were similar to mine or wildly different. Additionally, we got asked straight up “What advice would you give to your undergraduate self”, so I was able to anonymously recite or paraphrase many of the responses, as that was an exact question that I’d put out in my emails. I’m so thankful that my friends took the time to write detailed, thoughtful replies – I haven’t seen some of these folks in years yet they truly put effort into their responses. Apparently the session was well received, as reviews were positive and I’ve had a couple of people reach out to me subsequently. That’s me standing up, and Nino sitting down. So what was actually in my presentation? Well, over the coming weeks I’ll share bits and pieces, rather than writing one enormous post (the presentation itself was almost 50 slides, and almost every slide was a distinct “lesson” that I’ve picked up). Check back periodically, or sign up for emails, and you’ll be in the loop! Finally, if any of you attended the event, I’d love to hear your thoughts, comments, feedback, etc.